Samuel was in Walpole on business connected with the agricultural industry when he met Annie Deveney. Sam and Annie met at a dance, and on Sam's third visit to Walpole, some months later, he proposed marriage and Annie accepted. They removed immediately to Brasher Falls, NY. Annie came to Walpole with her parents and brother and sister around 1915. 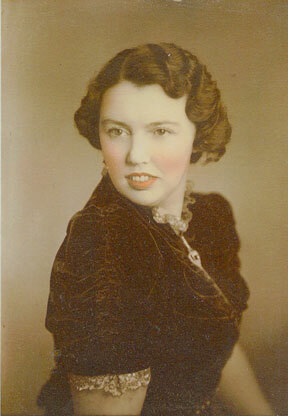 She was a hairdresser and manicurist, and had a shop in the Misses Russell Millinery store on Main Street in Walpole. It was Annie's first and only marriage. Samuel and Annie Buell resided on his farm in Brasher Falls, NY. They owned property in Brasher, NY, which was deeded to St. Lawrence County on 4 December 1941. Sam and Annie as Grantors gave their residence as Moira, Franklin County, NY. [S493] Letter, Francis D. Donovan to James H. Holcombe, 30 Dec 2003, from Register of Deaths, NY, Register 6, Page 53. Wallace and Jeannette were enumerated in the 1880 Geneva, Ontario Co., NY, federal census. He was a farmer, age 43, she was 32. Children in the household were Ida M. 12, Horton, 10, and Ebenezar, 8. David L. and Ida A. were enumerated in the 1880 Arcadia, Trempealeau Co., WI, federal census. He was a farmer, age 32, she was 26. The only child in the household was Allie, 4. James Buell married Alvira Patterson. Alvira Patterson married James Buell. The 1900 census record indicates Cecil was born in Oct 1893. [S182] Social Security Death Index (on-line), Ancestry.com, SSDI, Ancestry.com, SSAN 113-07-4376. Elizabeth B. Leslie was born on 19 October 1822 at Orange, Wells River, VT. She married Judge Julius A. Hayden, son of Luke Hayden and Ruth Humphrey, in 1843. Elizabeth B. Leslie died on 5 March 1845 at age 22. Information on Elizabeth is from Julia Hayden at www.julen.net. Erald Sanders was born on 12 December 1900. Erald Sanders was the child of Ralph Morgan Sanders and Myra Dunsmore. Inez Holcombe was born in March 1899. She was the daughter of Albert Sylvanus Holcombe and Elinor Rumiser. Violette Flora Holcombe was born in 1900. She was the daughter of Albert Sylvanus Holcombe and Elinor Rumiser. Grace Laverne Holcombe was born on 21 October 1902. She was the daughter of Albert Sylvanus Holcombe and Elinor Rumiser. Grace Laverne Holcombe died on 22 January 1978 at age 75. Nellie Holcombe was born on 6 December 1908. She was the daughter of Albert Sylvanus Holcombe and Elinor Rumiser. Nellie Holcombe died on 25 December 1908. Alberta Ann Holcombe was born on 5 April 1914 at Santa Rosa, Sonoma Co., CA.1 She was the daughter of Albert Sylvanus Holcombe and Nellie Ervin. Alberta Ann Holcombe died on 2 August 1993 at Boise, Ada Co., ID, at age 79.1 She was buried on 6 August 1993 at Dry Creek Cemetery, Boise, Ada Co., ID. Alberta Ann Erbland 79, of Boise, devoted wife and mother, passed away Monday, Aug. 2, 1993, in a Boise hospital of natural causes. Funeral services will be held at 10 a.m. Friday Aug. 6, in the Alden-Waggoner Chapel, with the Rev. Jon Brown, of First United Methodist Church, officiating. Eagle Auxiliary Lodge rites will be conducted by the Eagle's Auxiliary, #115. Burial will follow in Dry Creek Cemetery, Boise. Alberta was born April 5, 1914, at Santa Rosa, Calif., a daughter of Albert S. and Nellie Ervin Holcombe. She moved to Boise in 1926. She graduated from Boise High School and attended Links Business School. On Oct. 16, 1938, she married George William Erbland. She was a 50 year member of the First United Methodist Church and a long time member of the Eagle's Auxiliary #115. She served as president of the Joint Americanization Council. She was also a foster mother and volunteer for Booth Memorial Home. Survivors include two sons, David William Erbland and Berkley Gordon Erbland; sister and her husband, Kathrine and Melvin Copp; four granddaughters, Christina Erbland, Jennifer Lowell, Hannah Baptista, and Kristen Boucher; two great-granddaughters, Mina Dittmer and Katy Lowell; her special friends, Elda Buchanan and Gerry Black; and many other special friends. The family suggests memorials be made to the American Diabetes Association, Idaho Affiliate, 1528 Vista Ave., Boise, Idaho. [S182] Social Security Death Index (on-line), Ancestry.com, SSDI, Ancestry.com, SSAN 519-10-0758. [S182] Social Security Death Index (on-line), Ancestry.com, SSDI, Ancestry.com, SSAN 118-01-5337. [S182] Social Security Death Index (on-line), Ancestry.com, SSDI, Ancestry.com, SSAN 097-26-3630.